Britain's Twentieth Century Society has hosted a lecture on Douglas Snelling's career to allow its members to assess suggestions by his biographer, Dr Davina Jackson, that he was one of England's internationally significant emigré modernists. 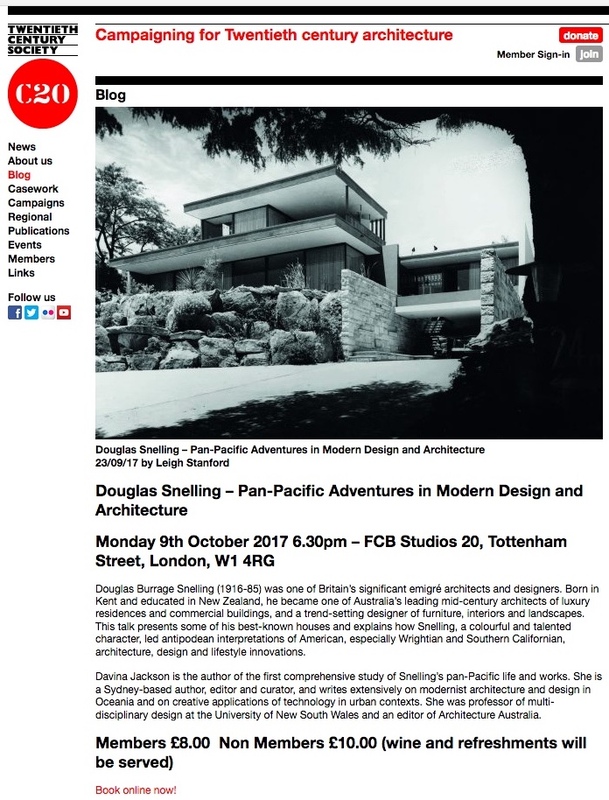 Co-hosted by the elite estate agency Modern House, Jackson's lecture was held on 9 October 2017 in the glamorous Fitzrovia event space of architects Fieldon Clegg Bradley Studios (led by Geoff Rich), and was attended by more than 50 modernism connoisseurs. Jackson showed 60 images of Snelling's furniture, interiors, buildings, landscapes and island resort schemes, and explained his birth in Kent, childhood in New Zealand, working visits to Los Angeles, successful career as a designer and architect in Sydney, late-career South Pacific projects, and his retirement in Honolulu. Her talk was introduced by the C20 Society's vice-president, Dr Timothy Brittain-Catlin, and Modern House marketing executive Emma Mansell. Dr Brittain-Catlin, who writes on British architecture and design for The Architectural Review, Building Design, World of Interiors and other newspapers and magazines, described Snelling as an 'interesting new figure' with potential to help historians understand key differences between mid-century British modernism and the more glamorous styles that prevailed in America and Australasia between the 1930s and the 1970s. While the English buildings of expatriate Australian architect, designer and illustrator Raymond McGrath were well-known and widely praised by British historians, the Australian achievements of English emigré Snelling were still not understood in his birth country. Dr Brittain-Catlin also congratulated Dr Jackson on her new PhD (which he supervised at the University of Kent School of Architecture); recognising her recent book on Snelling and other publications on South Pacific modern architecture and design. One of Britain's leading scholars of California modernism, Professor Neil Jackson (University of Liverpool in London and current president of the Society of Architectural Historians of Great Britain) noted after the lecture that Snelling's character and career reminded him of Craig Ellwood, the flamboyant, self-invented, California builder and architect who was best known for designing several steel and glass houses in the Arts and Architecture Case Study program. Jackson (not related to Snelling's biographer) wrote the 2002 monograph on Ellwood: differently published as Craig Ellwood (by Lawrence King Publishing in London) and California Modern: The Architecture of Craig Ellwood (by Princeton Architectural Press in New York). He also compared some of Snelling's early houses to late-1940s residences designed by another Los Angeles architect, Gordon Drake. These comparisons have been mentioned in other posts on this website: see Ellwood re Snelling here; Drake re Snelling here.